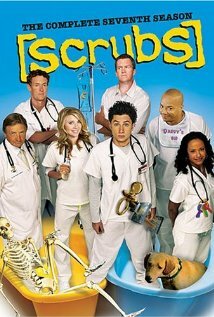 Scrubs is a comedy show that takes place in a highly unusual setting for the genre, a big american hospital. But don’t worry, the stories usually don’t involve life-or-death operations, and revolve around the personal relationships of a group of young doctors. After all, a hospital is a workplace as any other, where all kinds of friendships, enmities and romances can sprout. This is a “new school” sitcom, filmed on locations rather than in a studio, and without laugh track. It’s also a short, quick-paced show, with only 20 minutes per episode. The main character is a John Dorian (aka J.D. ), a young, good-natured doctor trying to find his way in his profession and sentimental life. He’s got a tendency to get lost in his thoughts, which are usually humorous and the audience can hear. His co-workers are a quite peculiar group, including his best friend and former co-student, the doctor who doesn’t want to be liked by anyone and the pretty co-worker who could be his great love if a number of obstacles didn’t prevent it. As the season so, the thoughts of these secondary character will also become audible to the viewers. The series was created by Bill Lawrence, who already had a success under his belt (the political satire Spin City), and lasted for nine seasons. Zach Braff, the actor playing J.D., was the main support of the series, as it only survived for a season after he left. That doesn’t mean the rest of the cast is weak, and in fact they’re a very likable and competent group of actors. One positive point of the show is that the depicted hospital isn’t in the constant tension seen in series like ER, and the doctors will usually treat common, not very threatening illnesses, showing us a lighter side of these institutions. 20 March 2003 - Season 2, Episode 18: My T.C.W. 06 November 2003 - Season 3, Episode 5: My Brother, Where Art Thou?